The Southern Indian state of Tamil Nadu has passed a bill backing the controversial bullfighting sport of jallikattu, which is traditionally practiced in its rural areas. Tamil Nadu’s assembly voted unanimously to pass the bill amending the Prevention of Cruelty to Animals Act 1960, to make jallikattu a permanent sport in the state. "The state government has decided to exempt the conduct of jallikattu from the provisions of the said central act and therefore the government decided to amend the act in its application to Tamil Nadu," The Times of India reported the government as saying. Jallikattu is a unique form of bullfighting that has been practiced for thousands of years in India. It differs from Spanish bullfighting as the bull is not killed, but instead participants wrestle money or gold from the animal's sharpened horns. But the sport was banned by India’s Supreme Court in 2014 on the grounds of animal cruelty. Animal rights activists say the spectacle causes unnecessary stress to the bulls, who are released into a crowd and forced to fend off people trying to ride them. Demonstrators, who numbered as high as 15,000, claim jallikattu is an integral part of their cultural heritage and that outlawing it would endanger the preservation of native bull breeds. The government temporarily lifted the ban on Saturday following weeklong protests including a student sit-in at Marina Beach in the state’s capital, Chennai, calling for its reinstatement. NDTV.com reported that the morning had begun with violence and arson, but during the week protests were peaceful. Those protests ended Monday when police informed the movement that lawmakers were moving to make the sport legal again. "Whoever is still sitting there [at the sit-in] is not a part of our movement. It's time for us to celebrate our success," said one of the main spokespersons of the movement, Raghava Lawrence, a famous movie producer and choreographer, NDTV.com reported. One protester reportedly died of dehydration in Madurai while demanding a "permanent solution" to ensure jallikattu’s unobstructed practice. 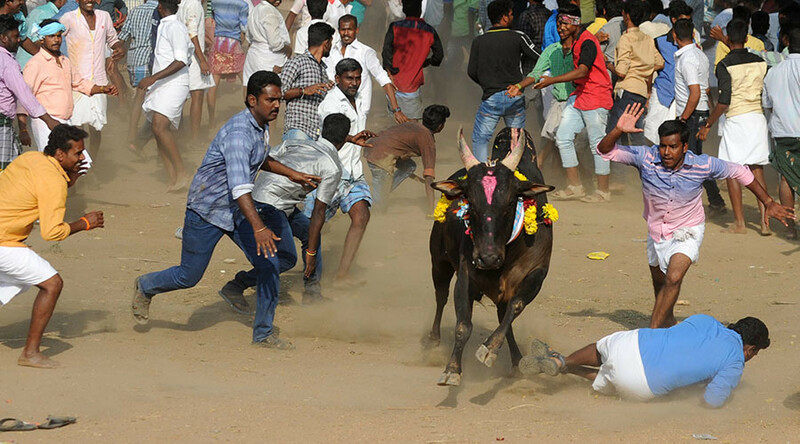 News of the amendment came after three young men were gored to death and 174 people injured during a jallikattu event on Sunday at Rapoosal village in Pudukkottai district, around 350km south of Chennai. In the Latin American nation of Colombia, the more famous version of bullfighting returned to the capital, Bogota, for the first time in four years. However, police in the city launched tear gas at around 1,000 protesters as they demonstrated against the return of the spectacle.